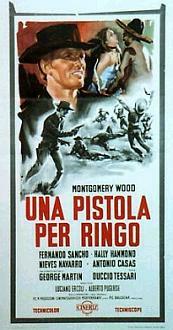 An angel-faced gunfighter (Giuliano Gemma aka: Montgomery Wood) is hired by a small farming family to infiltrate a ranch overrun by Mexican bandits and to save their hostages, including the fianc�e of the local sheriff. Also stars Fernando Sancho, Lorella De Luca and Nieves Navarro (aka: Susan Scott). Also with Antonio Casas and George Martin (aka: Francisco Mart�nez Celeiro). (In English and Italian language, with English subtitles for the Italian language sequences). On October 1st, 2013, Giuliano Gemma died following an auto accident near Rome. He was taken to a hospital in Civitavecchia and pronounced dead shortly after his arrival. Two other passengers, a man and his son, were also injured in the accident. Gemma was 75. This film came from an uncut-widescreen German import print in very nice picture quality.